We left the Exumas for this???? You may recall from reading the Feb 9th George Town post that we’d chartered a MC41 out of Hope Town in 2007. The day following our Saturday arrival brought a moderate cold front accompanied by 20-25mph winds. Since our T-shirts read “Extreme Novices- Beware!”, the strong winds kept us on the mooring until Tuesday when Russ threatened mutiny – we’d power only- no sailing- if only we’d be allowed to go. 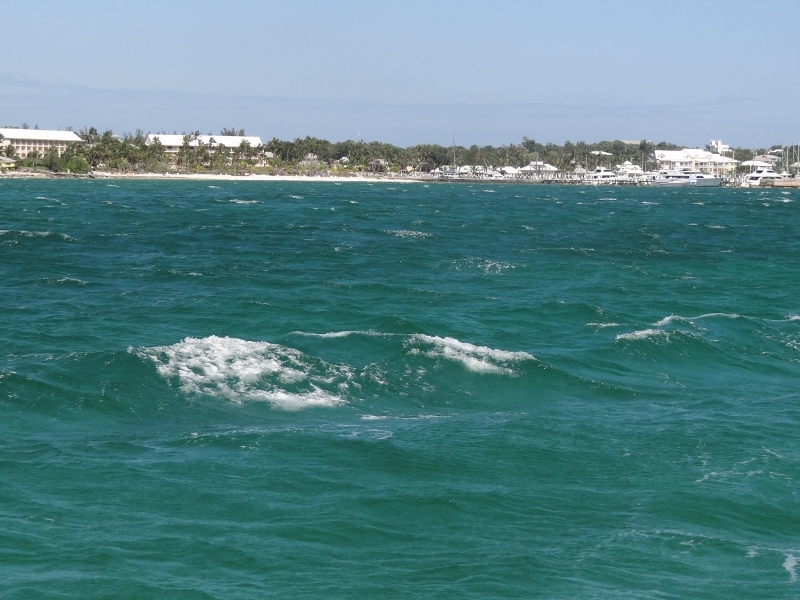 Fast forward to Sunday, March 4, 2012 and here we are in Abaco with a nasty cold front gunning for the central Abaco region; Green Turtle Cay to Marsh Harbor. 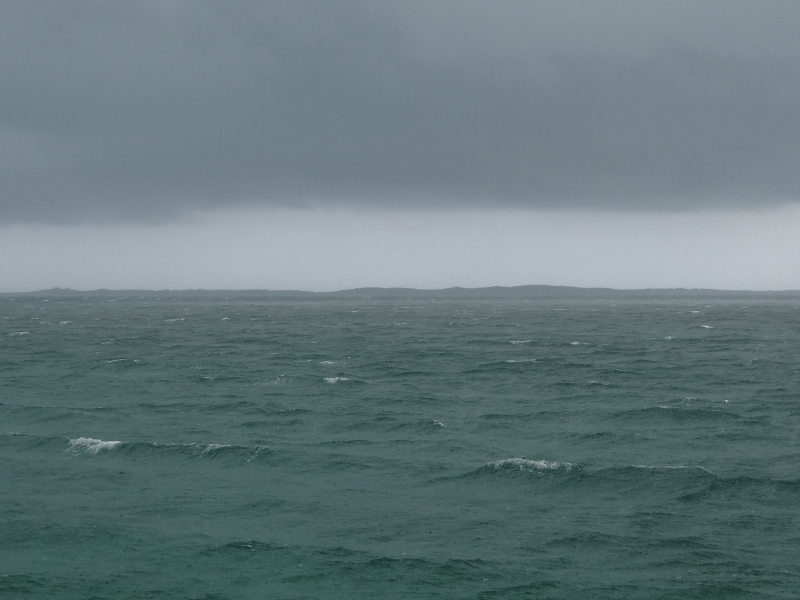 We awoke to SSW winds around 20kts with a forecast of 25 – 30 by mid-day, line squalls approaching from the west ahead of the front line which was to hit between 3 and 4pm, then wind switching to north. Gulp. Not greatly different from the forecast we obtained last Thursday, just that we’re always hopeful of improvement. Picking up the anchor is always: Russ on deck to remove the bridle and direct me as he uses the windlass switches to raise the anchor. I am at the helm using the proper engine(s) as directed by Russ’s hand signals. If the winds are light I only have to put the engine in gear; only occasionally do I need to us some throttle. Today, Russ warned me that I’d have to “be aggressive” on the throttle. He removes the bridle ok, but suddenly the boat is not aligned well at all to the anchor chain and he begins making every hand motion know to man (well, almost). We now quickly switch places because the end of the anchor chute is bent sideways; guess I wasn’t quick enough nor aggressive enough. Russ does much better; the anchor comes up and back into its place without further incident and now we have a new plan for anchor retrieval with winds >15. We motor- sailed with the jib, watching the overhead display show the wind speed climbing steadily. Vulcanchecked in with us; John’s in Hope Town on a mooring and moving back to Marsh Harbor soon. Too sloppy even in the protected Sea of Abaco to run the water maker but once anchored it ran for the entire afternoon. We chose a spot just southeast of Marsh Harbor’s harbor on the east side of Great Abaco Island. This would provide protection mostly from the west but also some from SW through NW. Better yet, we managed to be near some resort cottages who had un-locked wi-fi to grab. Something to do since our plans to shop in town were down the drain- or blown away is more like it. By 2:30 the wind was gusting over 30kts with 37kts the most I observed. Marsh Harbor has a Cruisers’ Net at 8:15 every morning on VHF 68 and just like George Town, weather is the first topic. During the day and just before the squall line, several reports, warnings really, were made on 68, but a look to the west and you couldn’t miss the dark clouds approaching. The squall line brought a quick change in wind direction and we swung 170 degrees from SSW to N in an eye blink, the drag alarms sounded because we’d moved more than 200 ft, the rain poured down and the wind gusted to 35, max. Places west of Great Abaco gave reports of 70 mph. The temperature dropped to 68 from the afternoon high of 81. All in all not a bad event, the Rocna had grabbed right off when we dropped it and for once we didn’t give much thought to a second anchor. Just in case though, Russ attached a trip line with a small red float so we’d know where it was in the event a second anchor appeared desirable. Now the question was how do we deal with Monday thru Thursday’s forecast of 20-25mph winds? A possible lull on Monday would allow us to head into the protection of a fairly crowded Marsh Harbor with the hope we could get to shore and shop, shop, shop. Oh, propane and laundry too.